Libya - The number of drowned individuals grows rapidly as waves of migrants and refugees attempt to cross the Mediterranean from Libya to Europe, warn the Euro-Mediterranean Human Rights Monitor and the International Humanitarian Law Center. Four boats sank near Libya’s coast last week as they set sail for Europe, states the two watchdog groups, noting that the latest deal made in Brussels at the end of last month has sparked a sudden increase in smuggling activity, with migrants fearing that more restrictions would be imposed by Europe. On 29 and 30 June, the Libyan Coast Guard saved the lives of 776 migrants, including more than 80 women and 11 children. They also recovered the bodies of dozens of dead, including three children. According to testimonies from Coast Guard members, migrants were distributed over four rubber boats sailing from a coastal area located to the east of Tripoli and started sinking before sailing far enough. However unsteady and shaky, the rubber boats were overloaded with migrants, resulting in a boat’s motor to catch fire, and causing another to sink. The number of drowned is estimated at about 104, while the actual number may be higher. The rubber boats carried migrants of different Arab nationalities; Egyptian, Syrian, Yemeni, Sudanese, and Moroccan, in addition to some others of African nationalities; Ghanaian, Nigerian, Zambian, Eritrean, Ethiopian, South Sudanese, Comorian, and Bangladeshi, the Geneva-based Euro-Med Monitor and the Libya-based IHLC added. The Libyan authorities should increase censorship along the coastline to protect migrants and asylum seekers from falling prey to smugglers and human traffickers. especially that they are exploited and carried offshore in large numbers. Although the Coast Guard has been successful at saving the lives of over 770 migrants, the rescue operation for the four rubber boats arrived late due to malfunction in one of the relief vessels, which requires more positive steps to better equip relief vessels, stated Mousa Al Qunaidi, Euro-Med’s Libya spokesman. Both organizations expressed their grave concern over the humanitarian situation inside the Libyan detention facilities housing migrants, as they have been reportedly subjected to violence and torture for years. Those detained have undergone a tough experience; their detention can never be justifiable, said Al Qunaidi. They should rather be sent to reception centers where they are to receive special treatment based on their medical and psychological conditions, added Al Qunaidi, calling on the Libyan authorities to respect human rights when dealing with illegal migrants and to revise the measures taken against them. 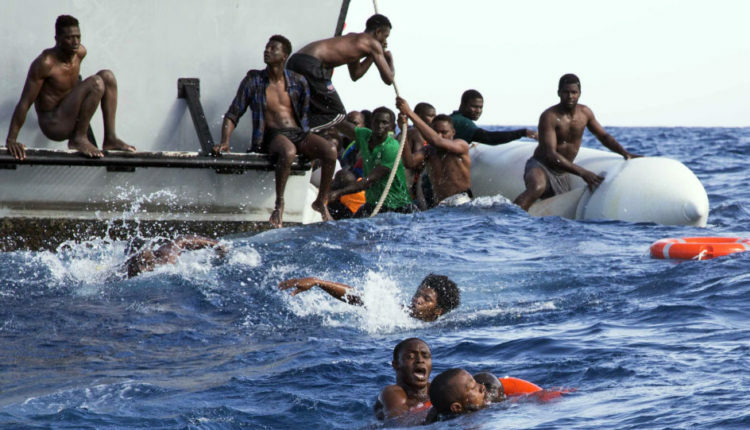 According to the International Organization for Migration (IOM), The Libya-Italy sea route is the most dangerous in the Mediterranean this year, with the number of drowned standing at 1,074, compared to 45 drowning near the Turkish coasts and 293 in the western Mediterranean route. The recent European policies following the special meeting held in Brussels on 29 June 2018 have contributed to the rising number of deaths in the Libya-Italy route. Refugees managing to arrive in Europe are to be held, according to the deal, at detention centers, to be later either sent to European States or be deported to their home countries. These policies provide for strengthening the security of the European coastal borders while offering support for the Libyan Coast Guard only to prevent the flow of migrants across the Mediterranean to Europe. The most recent European deal provides for the creation of the so-called regional landing platforms outside EU States, so that migrants and refugees rescued in international waters are gathered to determine whether to grant them refugee status. Refugees managing to arrive in Europe are to be held, according to the deal, at detention centers, to be later either sent to European States approving their asylum applications or be deported to their home countries. to strengthen the security of the European borders. This deal led to an increase in smugglers' operations; they started working faster to smuggle migrants and asylum seekers prior to any practical measures starting to take effect. This contract comes after a series of bilateral agreements between the EU and other countries, such as Turkey and Libya, further burdening migrants and asylum seekers with heavy restrictions, including those fleeing wars and conflicts. In effect, these individuals fall prey to smugglers and human traffickers, when they are supposed to receive humanitarian treatment and be allowed safe routes to flee their conflict-torn countries, Al Qunaidi added. The Euro-Mediterranean Human Rights Monitor and IHLC call on EU States to share in the collective responsibility towards migrants and asylum seekers by allowing them safe routes instead of creating more obstacles for them, while also leaving them to suffer the dangerous sea routes and human traffickers. The two organizations further call on the Libyan authorities to strengthen the security of the coastal borders and improve the rescue operations in its regional water, in addition to creating reception centers to provide good medical and psychological treatment for survivors instead of sending them to detention centers.